The last ten days are a blur. My head hurts. My emotions are numb. I live in a fairly high level of chaos. My future is uncertain. I am surrounded by people who love me. I am part of a ministry team that is on the front lines in making a difference for our displaced church family and community. I am a part of the Paradise Camp Fire story that is being played out here at home and around the world. Thursday, November 8 dawned like any other morning. When I got up, there was a distinguishable trace of smoke in the air. By the time I had my breakfast and got into my devotional time, the skies were raining ash. My wife called from her office at Adventist Health/Feather River to let me know that the entire town was under evacuation orders. While she drove home, my son, granddaughter, and I hastily ran through our homes collecting family pictures, electronics, important documents, and a few clothes. Soon after Linda got home, we drove into the smoke and headed out of town. On Friday afternoon we pulled into the Redding Home Town Buffet for lunch and Wi-Fi access. 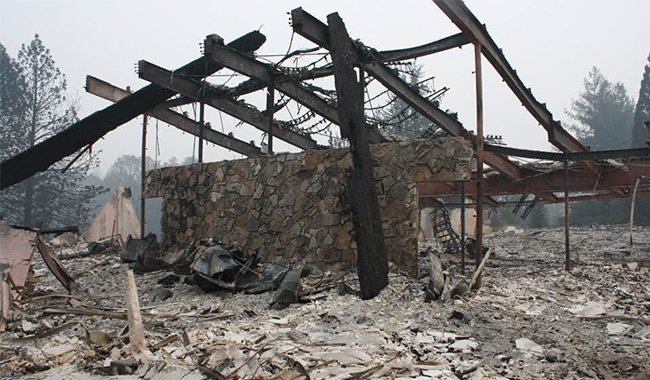 It was then that I saw the first pictures of my large church campus – totally destroyed. The whole thing hit me like a sucker punch. Still, there was no word about our home. Sabbath afternoon we connected with a friend who had access to Paradise and asked him to check on our home. A few hours later we got the word and pictures: Our home was a smoldering heap of ashes. Once again a tsunami of emotions swept over my soul. Forty years of home and comfort were suddenly snatched away. The Camp Fire is deeply personal for me. I lost my church and my family home. Every Northern California Conference pastor in Paradise lost their home, and some of our retired pastors as well. Twelve of our academy teachers lost their homes. Our church home is gone. While most of our academy sustained minimal damage, our K-4 wing has been destroyed. Big pieces of our hospital campus have been wiped out. At least 90% of our community is flat. Our community infrastructures can no longer hold the weight of our loss. The smell of smoke and death fills the air. The devastation is beyond comprehension. There are some things that fire cannot destroy. Our church family is amazing. And our sister church in Chico has welcomed us with open arms. High talent people are flying and driving into town to help us put our lives together. Friends and family from across the country and the world are showering us with resources to get us through the tough times. And while we are in the thick of hard times and our thinking processes are not functioning at full capacity, there are a few leadership lessons I am learning for every day and crisis pastoral leadership. 1. Feel the Love. Truckloads of clothes and toiletries have been shipped into town. Phone calls, emails, and social media support have come pouring in. Packs of gift cards are showing up in the mail, or are being hand delivered to our temporary church office. GoFundMe accounts are being set up. Whole conferences and union conferences are rallying resources to help us serve the people and rebuild. Even our local conference camp staff were at church yesterday handing out bags of granola. I really believe that an important part of loving people is letting them love us. 2. Learn to Live With Chaos. Things are crazy around here. There are pastoral and staff huddles that must be held. There are volunteer teams that must be mobilized. There are projects that must be attended to right now. There are people who need housing and other forms of assistance today. There are people dropping into our office that just need someone to hold them, cry with them, and tell them that they are going to make it. There are the phone calls and emails that demand our immediate attention. Lots of things are happening all at once. I am learning to deal with it moment by moment. 3. Take Care of Yourself. If you don’t take care of yourself, especially in a time of crisis, you will quickly burn out and become a liability to the cause. Here’s what I am learning: Do your best to get quality rest at night. Eat the most healthy food you can find. Get some exercise to burn off the stress. That one is hard, especially when the air is filled with a toxic soup. Walk the mall. Find a gym that is giving out free day passes for those who have been displaced. Find some quiet time for yourself. Take a power nap when you find yourself overwhelmed. Take all the time you need with your family. Enjoy healing hugs with the important people in your life. 4. Get Into the Game. I’m discovering one of the best things you can do to find healing for yourself and promote community healing in a time of crisis is to serve. You really must pace things well, and work in phases. Get a new church office up and running. Get your school team into gear and reopen your school on another campus as quickly as possible. Do clothes and toiletries for a few days. Then move on to housing. Then move on to mental health services and legal support services. You can’t do everything all the time. So take it one or two pieces at a time. 5. Everything Takes Longer. Now that we have been displaced, it takes longer to get anywhere. Now that our equilibrium has been shaken, it takes longer just to think things through and get things done. Now that Paradise is lost, it’s going to take a long, long time to clean the place up and rebuild. And so more than ever, patience is a virtue. That’s why I am in this for the long haul.